We bet you have never heard a deal as drool worthy as Droom Grand Sale Auto. Yes, you read that right! Grand Sale Auto is back with a bang offering promising savings on all automobiles services. 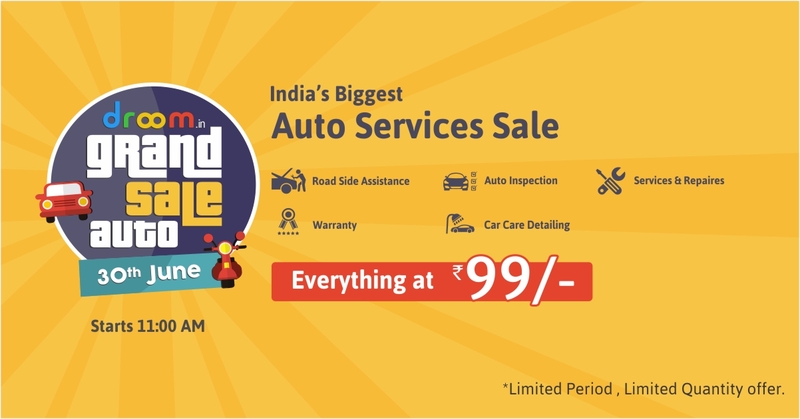 Starting 30 June 2016, 11:00 a.m., this is India’s biggest auto service sale where you can buy services including car care detailing, road side assistance, warranty, and more for peanuts. This truly extravagant sale allows you to buy various automobile services for as low as ₹99. Grand Sale Auto’s offerings are a must-buy for all automobile owners. This is a limited time and limited quantity offer. At Droom you can buy various automobile services including Car Care and Detailing, Road Side Assistance, Auto Inspection, Services & Repairs, and Warranty. You can make most of these low price service deals and get your vehicle ready for monsoon. Save some money, while giving your bike or car an intense clean up, comprehensive warranty or safety with road side assistance. Remember, it is 24 hours only sale. So, don’t miss this out. Droom’s comprehensive automobile services offer complete package of everything and anything that fall under every requirement list. Services like Road side assistance and warranty is a must have for any vehicle owner to avoid any uncertain situation on the roads. Services and repairs is quintessential on regular basis to maintain the overall health of your car or bike. Book your service now. Also find out more used vehicle deals available at Droom. Electric Mobility and Self-Driving: The Apple Titan Project. Can Apple succeed where nobody else has?